Contemporary western circles interested in Buddhism (not specifically Theravāda or Mahāyāna) sometimes display both a decided predilection for the “historical Buddha” Śākyamuni and hesitant reservations about other buddhas, which are considered later developments and hence unimportant. Many people are concerned with getting back to the “original Buddhism” and this is usually attempted via the Pāli canon, though in recent years there has come to be an appreciation for Gāndhārī. In the “original Buddhism” there is sought a pure and untainted philosophy free of disagreeable religious elements. I think this reveals something about a contemporary and common western rationalistic mindset which, rooted deep in materialist assumptions, relegates transcendental experience and knowledge to superstition or at best interesting fiction. Nevertheless, we have to bear in mind that the idea of a “historical Buddha” is a modern creation. While not all ancient Indian thinkers accepted the existence of countless buddhas simultaneously existing, they still had a view of many past buddhas. Nāgārjuna in his Mahāprājñāpāramitā Upadeśa notes the difference of opinion as follows. For example, when a deer is not yet wounded by an arrow it does not know fear. Once it has been wounded it leaps around and flees. People are also like this. When there is the suffering of old age, illness and death, they hear there is just one buddha and that it is very difficult to encounter them. Their mind then experiences fear. Diligently practicing they quickly attain liberation from suffering. Consequently, the buddha in the śrāvaka-dharma did not speak of there being buddhas in the ten directions. He also did not say they did not exist. If there are the buddhas of the ten directions and you say they do not exist, then you are guilty of limitless transgressions. If there are no buddhas of the ten directions though I say there are, then I produce immeasurable thoughts of the buddha and obtain the merit of veneration. Why is this? It is because the meritorious power of the causes and conditions of a virtuous mind is great. The Buddhadharma appears and vanishes in cycles. In a given age there will be a time when nobody knows of the liberating Dharma. An individual at some point becomes awakened and once again turns the “Wheel of Dharma” (dharma-cakra). In due time the teaching fades from the world and is completely forgotten. This time frame is never fixed. During the dark age when the Buddhadharma is not immediately available, some individuals achieve awakening and liberation on their own by contemplating the twelve links of dependent origination and hence become pratyekabuddhas, but never teach their method of liberation to anyone. It is only a buddha who restarts the turning of the Wheel of Dharma. Viśvabhū was the last (1000th) buddha of this kalpa. Śākyamuni was the fourth buddha of this kalpa. Maitreya will be the fifth. The present kalpa started relatively recently in terms of cosmic time. In due time the Buddhadharma as taught by Śākyamuni will be forgotten and thereafter in some distant future Maitreya will become the fifth buddha of this kalpa. 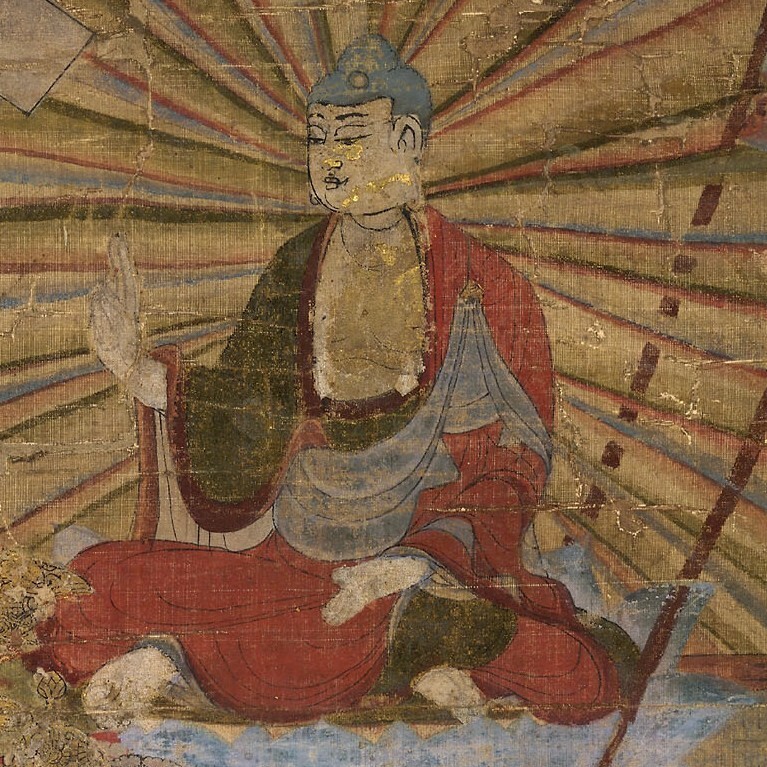 Mahāyāna literature provides names for thousands of buddhas of the past and future. They are often recited as part of liturgy. The existence of countless buddhas is quite a profound idea, but especially if you view a buddha as a kind of transcendental force among beings. As I discussed before elsewhere, the vision of the Buddha as taught by the Mahāsāṃghikas was quite different from the Sthaviravāda/Theravāda. The Mahāyāna, which no doubt emerged from the Mahāsāṃghika branch of early Buddhism, likewise had a perspective of the buddha as a transcendental force (i.e., the dharmkāya). In that sense if there are immeasurable worlds and incalculable beings suffering and likewise innumerable tathāgatas arising, then regardless if in our world there is no immediate buddha walking the earth, one can be confident there are still buddhas simultaneously “standing nowhere like infinite space” and as a result of their transcendental nature still interacting with the world in subtle ways. Consequently, Śākyamuni becomes just one of many buddhas is the vast expanse of cosmic time and space. This provides the ideological framework and justification for devotion to Amitābha Buddha or Vairocana Buddha instead of Śākyamuni, who is not derided in any way, but just counted as one of many buddhas. As I wrote about earlier, the iconic bronze buddha statue at Tōdai-ji in Nara, Japan is Vairocana Buddha, specifically the one mentioned in the Brahma Net Sūtra 梵網經 which quotes Vairocana Buddha directing the buddhas present at the assembly to transmit the Dharma to “innumerable Śākyamunis”. Now, granted, this sūtra is thought to have emerged in China, but nevertheless it does demonstrate that early on in the 5th century people there saw Śākyamuni as just one of many buddhas. There was clearly no sense of a “historical Buddha”. In the sūtra it is Vairocana Buddha who holds supreme precedence. The obvious response to this sort of thing is to ask if somebody just made this up for whatever reason. As with much religious literature you can never be quite sure about these things. However, we do have records of eminent Buddhist masters having visions of bodhisattvas and buddhas, and subsequently producing insightful texts as a result. Probably the most notable example of this is the Mahāyāna Sūtrālamkāra (in the recent English translation entitled The Universal Vehicle Discourse Literature) which as tradition holds was composed by the tenth stage bodhisattva Maitreya and transmitted to Asaṅga (4th c.). Thus, the modern prejudice that a celestial being named Maitreyanatha, renowned as the bodhisattva who is the next buddha on Earth, waiting in Tushita heaven, could not exist since there are no celestial beings, there are no heavens in the desire realm, there is no such thing as a genuine revelation, and so on, is nothing but a prejudice, a bit of modernist, materialist, secularist ideology, no more or less rational than a belief in all of the above. In reality this is not so unusual. In ancient India transmundane sources of knowledge were not so uncommon. As Richard L. Thompson in his work Vedic Cosmography and Astronomy points out, the classical Indian astronomical treatise entitled the Surya Siddhanta is attributed to demi-gods.2 In other words, such knowledge was originally not of this world. Now this attribution might have occurred to sanctify the knowledge as a means of acquiring prestige and consequently resources, but we will likely never know. Incidentally, if you are interested in classical Indian astronomy see Richard L. Thompson's paper “Planetary Diameters in the Surya-Siddhanta” available here. The ancient Indian astronomers often had accurate astronomical knowledge, which again they curiously attributed to transmundane beings. Thus have I heard. At one time the Bhagavān was abiding in the Tathāgata's Blessed Vast Great Vajra Dharmadhātu Palace where all vajra-holders had assembled. Clearly this is not in Magadha on the subcontinent. The teachings are given in a transmundane realm. The whole point though is not so much the venue, but the teachings contained within which the upholders of the tradition would call buddhavacana or "words of the Buddha". In the English speaking western world, especially in the popular print, there is a tendency to shy away from or just outright sanitize Mahāyāna of any disagreeable mystical elements and refocus exclusively on mindfulness and the virtues of benefiting beings, compassion, kindness and generosity. While such virtues are not wrong, it is a reflection of a largely unrecognized desire amongst many modern people to warp their Buddhism into something that would be considered palatable with secular humanists. This is entirely divorced from the original richness of Mahāyāna mysticism which in itself a process of transformation by which one becomes all the more compassionate, aware and lucid. The aim is to overcome suffering and there have been adepts for thousands of years singing praises about practice. To deny their message is to reject a potential cure for individual human woe. However, if the running assumption is that transmundane buddhas do not really exist and if you do experience such things you are probably schizophrenic, then the gateway towards profound transcendental experiences, which are time and again described in Mahāyāna literature as positive and desirable, closes and becomes inaccessible. This ties in with why the teachings of transcendental buddhas and bodhisattvas are not given the same weight as what the “historical Buddha” taught. The academic literature speaks of the "authors of Mahāyāna sūtras", and hence transcendental teachings are suddenly made all too human, assumed to be mere deviant products of later people’s imagination and not at all the intent of Śākyamuni Buddha. Academics of course have every right to frame their discussions with such language, but some of the traditional accounts of where these teachings came from should be taken into consideration as well. You sons of the Buddha! After the Buddha has passed, when one has a good attitude and mind desiring to receive the bodhisattva precepts, one may go before images of the Buddha and bodhisattvas to make vows and receive the precepts alone. One should practise confession for seven days in front of the Buddha. It is when one witnesses auspicious signs that the precepts have been obtained. If one does not attain auspicious signs, then one must after fourteen or twenty-one days, or even up to a year, attain auspicious signs. When the auspicious signs have been attained, one then may go before the images of the Buddha and bodhisattvas to receive the precepts. If one does not attain auspicious signs, then even if one receives the precepts before a Buddha image, the precepts will not [really] have been obtained. If there is physically present one Dharma Master who has previously received the bodhisattva precepts and one then goes before them to receive the precepts, then there is no need to witness auspicious signs. Why? It is because the Dharma Master's masters have successively transmitted them. There is no need for auspicious signs. Therefore, going before the Dharma Master to receive the precepts one obtains the precepts. This is because having produced a serious mind one thus obtains the precepts. If within a thousand miles there is no master who can transmit precepts, one then goes before images of the Buddha and bodhisattvas to receive the precepts, though one must witness auspicious signs. Auspicious signs are various odd signs such as the Buddha rubbing one's head, seeing light and seeing flowers. In East Asia this is actually a specific type of repentance practice (repentance with signs 取相懺). The practitioner contemplates past faults and transgressions until such auspicious signs are witnessed. The idea is that such signs are an indication that past karma has been purified. When repentance of past misdeeds is done sincerely and such signs are observed it can be quite profound and transforming, effectively rejuvenating a person. However, on a much more objective level, yogic practices can also produce measurable and observable physical effects. There is naturally a great deal of scepticism towards his work. Some criticism is directed at the fact that most of his cases, but not all, are reported in places where reincarnation is a commonly held belief. This is valid criticism, but it still does not erase the large amount of evidence produced by other researchers that suggests the reality of reincarnation. His successor at the University of Virginia's Division of Perceptual Studies Dr. Jim Tucker still carries on this research focusing on cases in the west. If a human persona can transcend the demise of the body (and the evidence suggests this is the case), then contemporary theories about the brain producing consciousness can be dismissed. It would also lend weight to the other claims made by ancient schools of thought which have been teaching this among other things. In this post I hoped to briefly provide some details and thoughts about some of the general mystical and transmundane aspects of Mahāyāna Buddhism which I feel are not discussed enough. I sense there is a lot of hesitation and uncertainty about this subject in the western Buddhist world. The result is rejection of rich tradition and distilled wisdom that is aimed at overcoming suffering and transcending the ordinary world. The innumerable buddhas found in the Mahāyāna were never considered by Mahāyānists to be later fabrications. The devotion, scriptures and practices that involve them go hand in hand with the path of liberation from suffering. It is a tried and tested path. In a future post I hope to discuss the question of the validity of the Mahāyāna canon. 1 See The Universal Vehicle Discourse Literature (New York, NY: American Institute of Buddhist Studies, 2004), xvii-xviii. 2 Richard L. Thompson, Vedic Cosmography and Astronomy (Delhi, India: Motilal Banarsidass, 2004), 9. 4 William J. Cromie, “Meditation changes temperatures: Mind controls body in extreme experiments,” Harvard Gazette, (April 18, 2002), http://news.harvard.edu/gazette/2002/04.18/09-tummo.html. 5 “Death and Dharma” (ABC National Radio, 22 July 2007), http://www.abc.net.au/rn/encounter/stories/2007/1980545.htm. 6 John Powers, Introduction to Tibetan Buddhism (Ithaca: Snow Lion Publications, 1995), 361. 7 Ian Stevenson, Twenty Cases Suggestive of Reincarnation, Second Edition (Charlottesville: University Press of Virginia, 1974), 15.